Tubbygaijin.com » Want to help Japan? buy Quakebook! #quakebook, the brainchild of Our Man in Abiko is a collection of personal accounts, photographs and drawings from people affected by the Great Tohoku Earthquake both directly and indirectly. 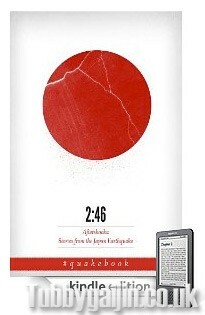 Sourced on twitter, the idea was to share experiences of the quake and raise money for the Japanese Red Cross at the same time, #quakebook has grown from that one idea into the huge collaboration available today. As well as the contributions of people across Japan and around the world, #quakebook also contains pieces by Yoko Ono, William Gibson, Barry Eisler and Jake Adelstein. It’s not merely a book, but a snapshot of a moment that changed a country forever. Amazon have waived their fees so 100% of the money from your purchase goes directly to the Red Cross, what better way to help? Buy Quakebook now, and spread the word!